The Galah or Cacatua roseicapilla, is a very common bird throughout Australia. It is an elegant bird standing between 34 and 38 cm tall. With a soft pink breast and grey wings the colour of ash, they can often be seen to changing colour when traveling together in flight. Their natural habitat is grassland, woodland, scrubland and farmland. However, it is not common to see these birds in urban areas and even in the City. They are a nomadic species, but will not go too far from water. 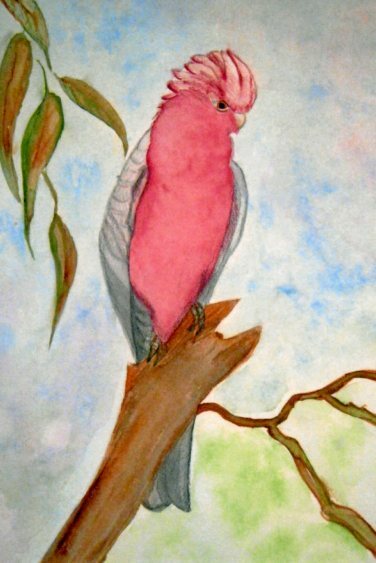 Margaret has depicted her Galah in the woodlands. New South Wales has large expanses of woodlands, both east and west of the Great Divide. On the Central Coast where Margaret lives, Galahs are a fairly common sight, especially in the spring. Often they are seen on grass reserves near the estuaries and lakes foraging for grass seeds in spring’s golden sunlight.